Judi Dench has more screen time in this film alone than Desmond Llewelyn had in his 17 films as Q, making her portrayal of M the most common character in the series after Bond himself. Production Design by Dennis Gassner. Title Song by Adele "Skyfall"
"Some men are coming to kill us. We're going to kill them first"
Four years since the release of Quantum Of Solace, EON and MGM were ready to make their 23rd James Bond film. This is currently the largest gap between Bond films without a change in the leading actor. There was uncertainty regarding future James Bond films when MGM almost went bankrupt back in 2009. They managed to pull out in December 2010 and announced that 'pre-production of James Bond 23 has commenced' in January 2011. The release of this film marked the 50th Anniversary of the first James Bond film Dr No in 1962, following year-long celebrations of the longest film franchise in history. Before the press conference in November, numerous actors were associated with the film. These included Tang Wei, Maggie Smith, Ana Araujo, Ebru Akel and Brianna Meigham; all of whom did not land roles in the film. The press conference revealed the principal cast but many of their characters were kept secret until the film was released. Filming began shortly after the press conference in London and quickly moved on to Shanghai, Scotland and Turkey before shooting the last few scenes in Pinewood Studios. The film includes many twists including the return of the beloved Q and Miss Moneypenny. SKYFALL also marks Dame Judi Dench's last time as James Bond's boss M. Ralph Fiennes' character Gareth Mallory takes over the position of M at the end of the film. Many of these twists were kept secret until the films release, although rumours of M's departure dates back to over 5 months before. The film premiered in London on 23rd October with the film being released in the UK three days later. 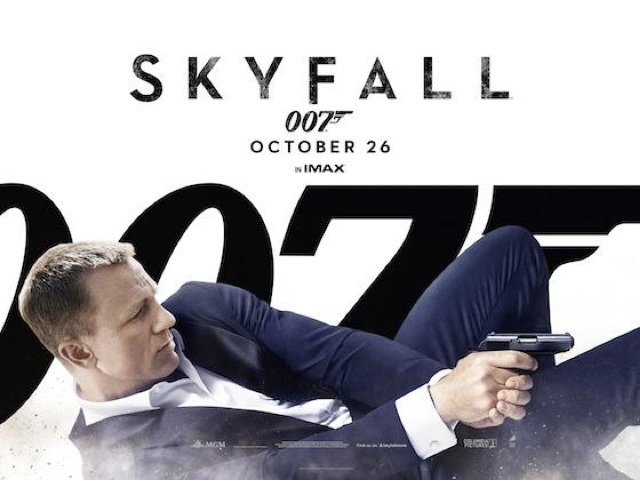 Critics said that it was the best Bond film ever of recent years and Skyfall quickly became the highest grossing film of the year. Most of the criticism came from the traditional gun barrel sequence appearing at the end of the film (like Quantum Of Solace).